Terry Gilliam is a director whose style has slowly grown on me over time. My introduction to him was through a friend when he showed me “Brazil” a movie that now since I have a great appreciation for his style and storytelling, plan on seeing (and this time reviewing) again. This is also a film starring two of my favorite actors. Jeff Bridges who is the master of drama and playing a wide array of roles, and Robin Williams…who I’ll be honoring in more of my reviews. He really needs no introduction and in this movie he captures both the manic humor and the intense loss and drama beautifully. I will get into the details in the assessment. 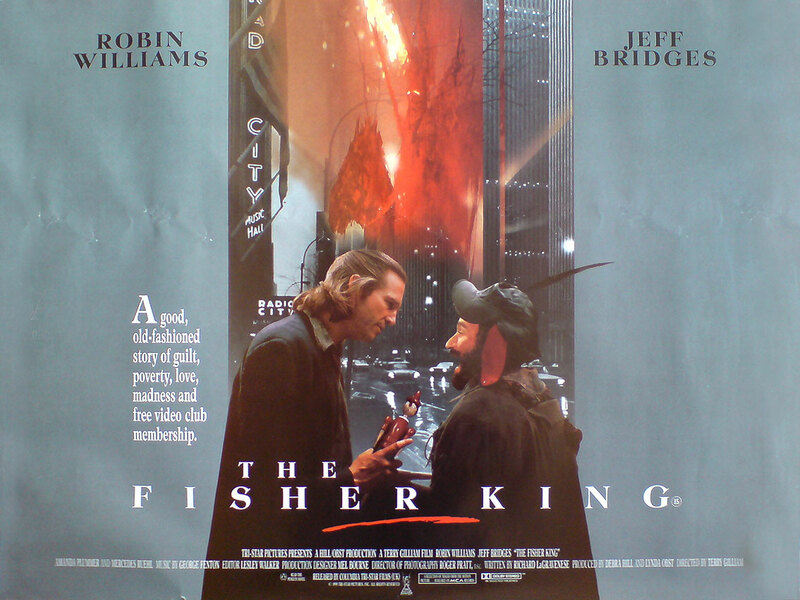 “The Fisher King” was directed by Terry Gilliam and was written by Richard LaGravenese. The story revolves around Jack (Jeff Bridges) who is a shock jock on the radio who inspires a man to do a mass killing. After a falling off the map for a while Jack is pulled back into the world through his interactions with Parry (Robin Williams) a man who has created a fantasy world to deal with the fact that his wife was killed by the man Jack inspired. From here story unfolds. The Pros: The Cinematography – There are a lot of great visuals in this movie. From the Red Knight who is Jack and Perry’s demons given form, to the boiler room that Parry is living in where he talks to the little people. The world feels gritty and fantastical and it is here the good as, as everytime it goes real world (mostly corporate) you see how people don’t care and how everything is metaphorically dead in how black and bare everything is. The visuals of the Red Knight as a devil figure are amazing too. The knight is large, breathes fire and has a horse that does the same. The killer also makes an appearance too, both in the flashback, in Jack’s mind when he is getting the Grail and his agent is made to look like the killer. The Writing – LaGravenese did a great job writing this. He captures the characters so starkly. Each of them feels real and none of them are prefect. They are all contradictions in their own ways (the selfish and selflessness of all of them at different parts). Which makes it really enjoyable to listen to as well as watch. The Symbolism – The symbolism is in the story of the title. The Fisher King is a grail legend with a few variations. The one that Parry tells in the film is of a King who was asked to protect the grail. He is than wounded by the sin of pride and he says he is thirsty. When the Fool gives him his cup he realizes it is the grail and that none of his heroes could find it, but the fool only gave it to him because he was thirsty. This applies mostly to Jack whose pride blinds him from Anne’s and Parry’s love which allow him to heal and get out of the environment that fed his selfish instincts. He learns to let go of pride and Parry is the fool who gives him the water from the grail. This is also in how a child gives him a Pinocchio doll and how both he and Parry becomes real people over the course of the film and beyond the doll state of their selfishness (Jack) and denial (Parry). Parry – Robin Williams is fantastic in this role. Parry is a man who has created a fantasy world (he is a Knight seeking the Holy Grail for the Little People and God) to live with the loss of his wife and her murder right before his eyes. You get glimpses of that night when he is beginning to find happiness and the demons in the form of the Red Knight return. He also became broken as he stalks a women and never really faces the actions from that since she falls in love and is flattered by everything he knows about her (What?). His arc is still really good though, and he never is able to deal with his past identity but he is able to finally morn what happened that night when he experiences it as a dream after Jeff gets the Holy Grail for him. Jack – Jeff Bridges does an amazing job as the man seeking redemption. He knows that his selfishness and looking down on others inspired a monster, so doesn’t allow himself to feel love or connection to anyone. It takes Parry saving his life in order for him to begin to change, and it takes the loss of Parry (when Parry gets attacked by his demons, thugs and goes catatonic) that he is finally able to admit his love for his girlfriend Anne and leaving the industry after he breaks into a millionaires castle to steal a grail for Perry. Anne – Mercedes Ruehl plays the only character who holds Jack accountable, and she does a good job. I wish we’d seen more of the reasons that she loves Jack though, considering he does take her for granted in most of the scenes until the end (with exceptions here and there). She is the one who supports him with Parry getting together with Lydia. Lydia – Lydia is awkward and clumsy, much like Parry. They also are very alone and don’t know how to connect with people. It takes Anne and Jack to help them do so. Lydia learns that she can have a mean personality and is able to face her inadequacy of fear of being used by Jack and ends up taking care of him when he goes catatonic. She is a great character who could have only been a plot device. Thank God, she was not and actually grew over the course of the movie. Her sparring with Lydia was fantastic as she is pretty cheap and Lydia is a business owner. She was played by Amanda Plummer. The Homeless Cabaret Singer – This is a bit part that is played by Michael Jeter, and he does great. He sings a song for Lydia for her to pick up her reward at Anne’s movie shop as part Jack and her’s plot to hook her up with Parry and it is his heart and soul that help open Jack up. Jeter is wonderful in this role and I wish he’d gotten more scenes. John De Lancie – He appears as a corporate big wig wanting to make tv show mocking the homeless as them living in a fantasy world, which is the final straw that wakes Jack up. He is good at playing the selfish git in the few scenes he has. Would I recommend this film? Yes, it makes me want to see more Terry Gilliam and is a favorite. Minus the fact that Parry’s stalking of Lydia is never seen as bad, he is good at helping people see the good in themselves and his fantasy world and visions enrich the film as his and Jack’s demons are given form in the forever stalking Red Knight. I highly recommend this film.